Saturday morning offered proof-positive that farming is very much an Old Testament endeavor, complete with Noachian flood. Friday was the Fourth of July. (Happy fourth, everyone.) While barbecues, fresh corn, and late-afternoon dips in the pool are wonderful, woe to the farmer who also has a social life: after a lovely visit with friends, we had the great idea to stop and watch the end of the Healdsburg fireworks. Fireworks mean traffic. Emmett and I got stuck in walking-would-be-faster traffic for half an hour, came home, packed up the car for the market this morning, and fell asleep sometime around midnight. We awoke at 4:40 a.m., shoveled cereal into our tired faces, and headed off to harvest in the blue, pre-dawn gloom. We had to be at the Healdsburg farmer’s market by 8 a.m., since it was our first time attending. We thought we had plenty of time for the pre-market harvest & wash — nearly three hours for a manageable amount of salad greens, bok choi, and chard. 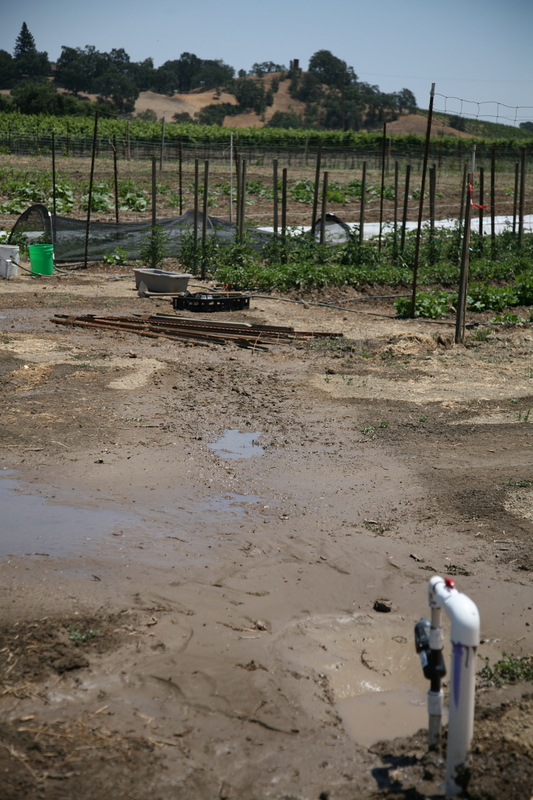 And we would have had plenty of time, if we hadn’t come upon one gushing pipe and one small lake that was rapidly encroaching on our tomato plants. Emmett and I sprang into action. 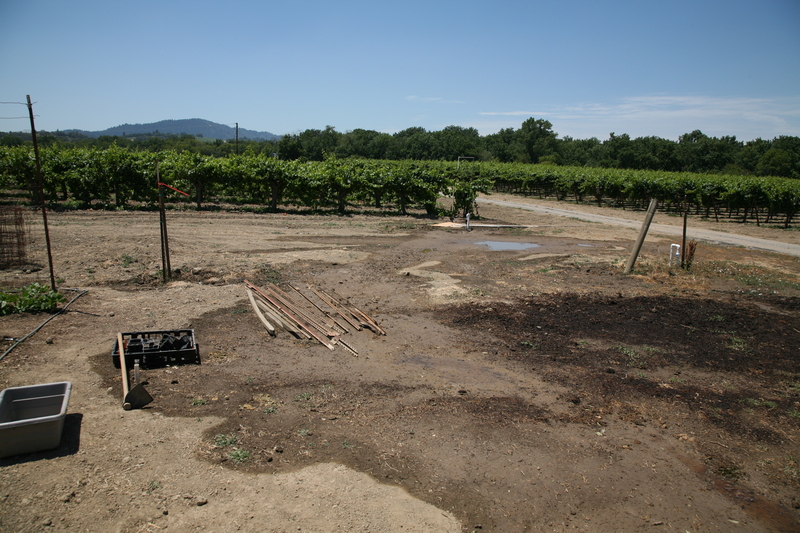 We grabbed some buckets, filled them with water, and then Emmett headed off to a different part of the vineyard to close the valves that fed the irrigation. I stayed by the pipe so I could raise my arms to let him know when the gushing stopped. I guessed that the note hadn’t been left while surrounded by water, and the closed valves also suggested that Emmett’s dad had turned off the irrigation — but that something had gone wrong. In the end, the culprit wasn’t a sinful planet and a vengeful God, but rather an emergency switch that linked irrigation to the foreman’s house. The mystery was solved when the foreman awoke to find his water pressure gone kaput. It just goes to show: when it comes to farming, you’ve got to expect the unexpected. Massive infestations of cucumber beetles? Sure. Flood, in the middle of summer with no clouds (let alone rain) in sight? You betcha.